UNITED NATIONS, January 13 -- The International Monetary Fund under Christine Lagarde has become even less transparent, answering fewer and fewer press questions. During the IMF briefing on January 12, the first one in four weeks, Inner City Press submitted four questions, including this: "On Greece, please describe the IMF's engagement with hedge funds asking them to accept a hair cut: are hedge funds reacting differently than banks and what is the IMF doing?" IMF spokesman Gerry Rice did not posed the hedge fund or the other questions. After the briefing, another IMF spokeswoman wrote to Inner City Press: "We will get back to you on your questions bilaterally Matthew. Gerry had already responded on Greece." 'We look forward to the resumption of talks between Greece and its creditors. It is important that this lead to a PSI agreement that, together with the efforts of the official sector, ensures debt sustainability.'" On Ukraine, what if the relation between that country's negotiations with Russia on gas prices and the IMF resuming talks, after Ukraine passed the bankruptcy legislation it said the IMF wanted? What else would the IMF like to see? During the IMF's briefing in mid December, Inner City Press has submitted another question about Malawi, which also went ignored. 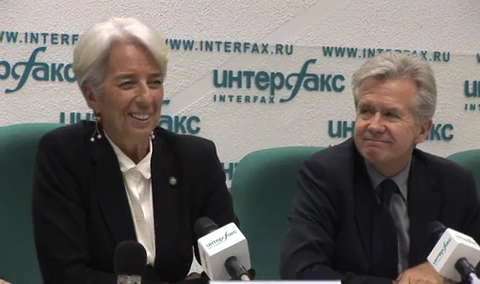 The IMF and Africa, under Christine Lagarde? We'll see. Watch this site.